An open, one-way, multiple-dose study was performed in twelve (12) healthy male volunteers. 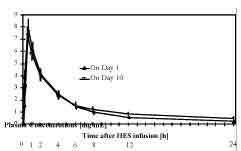 Daily infusions of 500 ml of HES (130/0.4) 10% solution were administered within 30 minutes on 10 consecutive days. The plasma and urine HES concentrations were determined repeatedly in the course of the study, up to 72 h after the final infusion. Both the peak plasma HES concentration and the time course of the plasma concentrations were similar on Day 1 and Day 10 of treatment. There was a marginal increase in the plasma HES concentration 24 h after the infusion, from approximately 0.23 mg/ml on Day 1 to approximately 0.48 mg/ml on Day 10. HES was eliminated from the plasma rapidly with α- and β-half-lives of some 1.2 h to 1.4 h and 21.9 h, respectively. The β-half-life on Day 1 could not be determined with sufficient reliability since the next infusion was given only 24 h later. Although the baseline-corrected AUC0–∞ on Day 1 is thus likely to have been underestimated, the geometric mean of 32.8 h·mg/ml was in fairly close agreement with the result of 35.7 h·mg/ml determined for the AUC0–∞ on Day 10. The results for the urinary recovery of 69% on Day 1 and of 70% on Day 10 agreed very well. It was demonstrated that no clinically relevant accumulation of HES occurred in plasma after multiple-dose administrations of 10 times 500 ml of 10% HES (130/0.4) solutions. Plasma Level of HES After Infusion of 500 mL HES (130/0.4) on day 1 and day 10 (mean SD) n = 12.